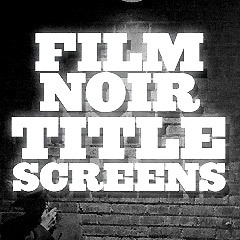 Movie Title Screens - Classic Film Noir (The 1940s and 1950s): Title screens are the initial titles, usually projected at the beginning of a film, and following the logos of the film studio. They are often an ignored aspect of films, although they reflect the time period or era of the film, the mood or design of the film, and much more. Beginning in the 1940s, the look and themes of many American crime and detective films were dark and downbeat, reflecting the insecurities and tensions of the time period. Classic film noir developed during and after World War II, taking advantage of the post-war ambience of anxiety, pessimism, and suspicion. It was a style of black and white American films that first evolved in the 1940s, became prominent in the post-war era, and lasted in a classic "Golden Age" period until about 1960. See also: Genre: Film Noir, and Classic Femme Fatales of Film Noir. A wide range of noir films - many of which are included in this compilation - counter-balanced the optimism of Hollywood's musicals and comedies. Fear, mistrust, bleakness, loss of innocence, despair and paranoia were readily evident in noir, reflecting the 'chilly' Cold War period when the threat of nuclear annihilation was ever-present. The criminal, violent, misogynistic, hard-boiled, or greedy perspectives of anti-heroes in film noir were a metaphoric symptom of society's evils, with a strong undercurrent of moral conflict, purposelessness and sense of injustice. There were rarely happy or optimistic endings in noirs.